Not your father’s T cells: CAR T cells are genetically engineered immune cells that MSK scientists are developing to fight cancer. Shown here are mesothelin-specific CAR T cells attacking a cancer cell (Credit: Prasad Adusumilli). A powerful genome-editing tool called CRISPR allows researchers to precisely modify the DNA of cells. In a first, MSK scientists have now used the technique to build better-functioning CAR T cells for use in cancer immunotherapy. Clinical trials in humans are being planned. Conventional CAR T cells are made using a retroviral technology that randomly inserts the CAR gene into the genome. For the first time, MSK scientists have used CRISPR to deliver the CAR gene to a precise location within the genome. CAR T cells built in this manner show improved performance in mouse models of cancer, raising the possibility of safer and more-effective therapies in people. Even as experts debate who deserves credit for developing CRISPR, progress using the powerful genome-editing technique is speeding ahead. The latest advance involves using the technology to build chimeric antigen receptor (CAR) T cells, a type of immunotherapy for cancer. In a new study published today in the journal Nature, Michel Sadelain and colleagues show how CRISPR can be used to create CAR T cells with improved performance — packing more punch against tumors in mice. CAR T cells have garnered acclaim over the past few years thanks to their stunning success in treating several types of advanced blood cancers, including acute lymphocytic leukemia and chronic lymphocytic leukemia. 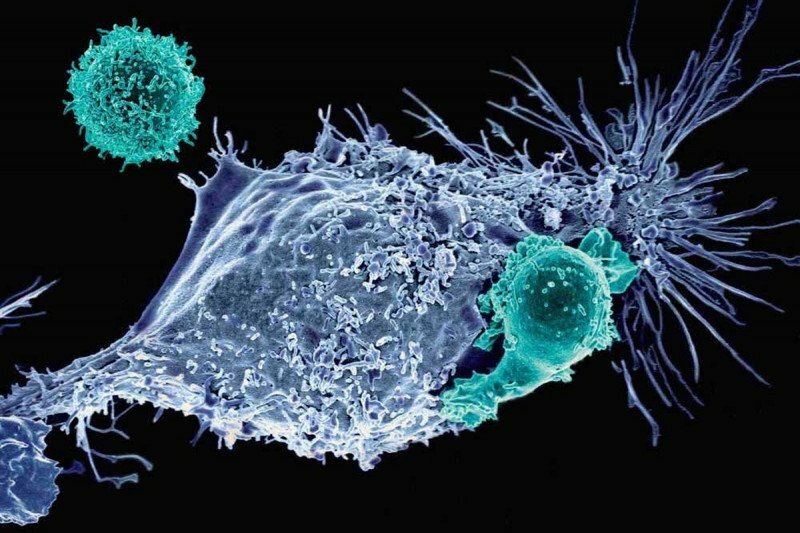 The approach, which was pioneered at MSK, involves equipping a person’s own T cells with special receptors that can find cancer in the body and initiate an immune reaction against it. These CRISPR-engineered CAR T cells seem to have an optimal level of functioning. To date, most CAR T cells are made using a retroviral technology that delivers the CAR gene to the immune cells. This delivery method results in the CAR gene being inserted at random into the genome of the recipient T cells. Because there can be unwanted genetic side effects that result from this somewhat scattershot approach, researchers are interested in developing more-precise delivery methods — FedEx for DNA. In their new paper, Dr. Sadelain and colleagues — including two postdoctoral fellows from his lab, Justin Eyquem and Jorge Mansilla-Soto — show that they can use a popular version of the CRISPR technology called CRISPR/Cas9 to put the CAR gene right where they want it, producing cellular cancer fighters with improved killing power. 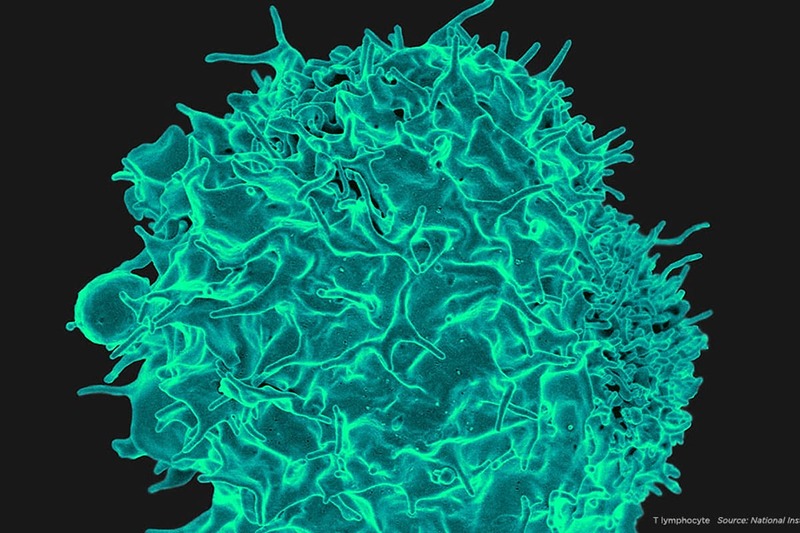 The team initially tested a few different genome addresses before deciding upon a particular region called TRAC, which stands for “T cell receptor alpha constant.” This region contains the gene for a part of the immune cell’s main detector of foreign proteins: the T cell receptor for antigen. Using CRISPR, the team was able to slice open the DNA at this location then slip in their new gene — the one for the CAR. The cells’ improved performance reflects the placement of the CAR under control of the regulatory machinery that normally governs the immune response to pathogens and cancer. Because of this precise positioning, the cells can turn the CAR on and off in a more natural fashion. In conventional CAR T cells, the CAR is on all the time, which can cause the cells to start out strong but then quickly lose steam. “In a way, they’re tamer cells,” Dr. Sadelain says. “They don’t go wild and that’s why they last longer.” And, because they last longer, you ultimately need fewer of them, which should make manufacturing easier, he says. The CAR T approach, which was pioneered at MSK, involves equipping a person’s own T cells with special receptors that can find cancer in the body and initiate an immune reaction against it. A second promising attribute of these cells is the result of what Dr. Sadelain calls the “two-in-one strategy”: He and his colleagues used CRISPR to both add the CAR to the TRAC locus and, at the same time, interrupt the T cell receptor gene, making assembly of a functional T cell receptor impossible. Knocking out this receptor means that it may be feasible to make CAR T cells using cells from a genetically unrelated donor, without worrying about a serious immune complication called graft-versus-host disease — when the donor immune cells attack the recipient’s normal tissues as foreign. Even off-the-shelf CAR T cells that could in principle work for anyone are a possibility with this approach, as discussed by Marcela Maus, Director of Cellular Immunotherapy at Massachusetts General Hospital, in an accompanying editorial in Nature. Though these results are certainly exciting, Dr. Sadelain says the ultimate test of these CRISPR’d cells will be when they are infused into human patients. The next step in this line of research will be to conduct a clinical trial to compare the safety and efficacy of CRISPR-built cells with conventional CAR T models. Two such trials, for people with B cell malignancies, are currently being planned at MSK. The use of CRISPR-modified cells in people would represent a true milestone in biotechnology, one that could serve to prod the entire field of genetic engineering forward. “The CAR field is likely to serve as a major testing ground for this emerging genome-editing technology,” Dr. Sadelain says. This work was supported by the Lake Road Foundation, the Mr. William H. and Mrs. Alice Goodwin and the Commonwealth Foundation for Cancer Research, Stand Up To Cancer/American Association for Cancer Research, the Lymphoma and Leukemia Society, NYSTEM, and the MSK Cancer Center Support Grant/Core Grant. Most of the CAR-T progress seems to have happened in the domain of liquid tumors. How far are we from CAR-T clinical trials on solid tumors like sarcomas? What types of solid tumors are likely to be the first ones? Dear Max, MSK already has two clinical trials using CAR T cells on certain thoracic cancers — lung cancer, mesothelioma, and breast cancer that has spread to the chest. You can learn more here: https://www.mskcc.org/announcements/combination-immunotherapy-boosts-ca…. Trials with additional solid tumors are being planned. Thank you for your comment. I have left a couple voice messages regarding my interest in finding out more about thevery CRISPR AND CAR T-cell immunotherapy techniques discussed on this article. I'd like to learn if/when any clinical trials will be available and what are the eligibility requirements. Thank you. Thank you for your comment and best wishes to you. Thank you for these wonderful and educational updates. I am a Biology Teacher and I use them in my teaching practice. I have so much faith in the work being done at MSKCC! Dear Adrienne. we’re glad to hear that you find our articles helpful for your students! Recently in the WSJ there have been article about the CRISPER. they talk about aa company whose symbol is EDIT. How do they compare with what is happening at MSK? Knowing about different companies will help in getting the annual reports to keep up on the research being done. Dear Betty, there are a number of companies that are developing gene editing technologies. Many labs at MSK use these technologies, including CRISPR, to advance our work. General question, my psa was 7.5, gleason of 6, only 50 years old, and 4 out 12 biopsy positive, what would be recommend ? Charles, thank you for reaching out. We recommend you consult with your physician on this particular question as every individual case is affected by many factors. For additional questions about prostate cancer treatment, you also can call the National Cancer Institute’s Cancer Information Service at 800­-4-CANCER (800­-422­-6237). To learn more about the CIS, including Live Chat help and how to send them an email message, go to http://www.cancer.gov/aboutnci/cis/page3. I have heard a lot about the progress of CRISP, but so far have only heard about it treating Leukemia. Are there any trials for it anywhere in the world on other sorts of Cancer? More specifically my lovely sister in law has TNBC and I was wondering if it could be used to treat that (as a non medic I don't see why it can't be used on all cancers)? We are in the UK, but could come to the US or anywhere else if it would help cure her. If your sister-in-law is interested in coming to New York for treatment as MSK, she can email international@mskcc.org or go to https://www.mskcc.org/experience/become-patient/international-patients for more information on becoming an international patient. Thank you for your comment, and best wishes to you and your family. I have Jak2 Mutation after bone marrow biopsy. Dear John, we’re sorry to hear about your diagnosis. If you would like to have a consultation at MSK to discuss your treatment, you can call 800-525-2225 or go to https://www.mskcc.org/experience/become-patient/appointment for more information on making an appointment. Thank you for your comment, and best wishes to you.